Jim Sarbh (born 27 August 1987) is an Indian film and stage actor. Best known for his supporting work in the Hindi Film Industry, he is the recipient of a Screen Award, an International Indian Film Academy Award and two Filmfare Award nominations. Additionally, Sarbh has directed and acted in numerous theatre productions in India. Sarbh made his feature film debut in 2016, playing the antagonist in Ram Madhvani's critically and commercially successful biographical drama Neerja; the role garnered him positive reviews from critics and such accolades as a Filmfare Award for Best Supporting Actor nomination and a Screen Award. Following his role in the thriller A Death in the Gunj (2016), he rose to prominence for playing antagonist in the period drama Padmaavat (2018) and the biopic Sanju (2018), both of which rank among the highest-grossing Indian films of all time. In addition to his film career, Sarbh has regularly appeared in theatre productions, particularly those based in Mumbai. He has attracted attention for his performances in the 2013 revival of Death of a Salesman, Rajat Kapoor's What's Done is Done, and Kalki Koechlin's Living Room. He made his directorial debut in 2014 with Bull. For his extensive work in theatre, Sarbh was listed in Forbes India's 30 under 30 list in 2015. Jim Sarbh was born in Mumbai, to a Parsi family; his mother is a retired physiotherapist, and his father is a former master mariner, and the Regional Director of P&O Ports South and Middle East Asia. The family moved to Australia when Sarbh was three years old and came back to Mumbai when he was eight, where he attended the American School of Bombay. He completed his undergraduate degree in Psychology from the Emory University, United States of America. He currently resides in Versova, Mumbai. After graduating from the Emory University, Sarbh worked with the Alliance Theatre in Atlanta for a year as a literary intern. He performed around Atlanta in the 2009 productions of such plays as The Show!, The Breakup, Tennis in Nablus, and Ice Glen; the last of the roles won him a Major Supporting Role Metropolitan Atlanta Theatre Award. Sarbh moved back to Mumbai in 2012 and began acting in local theatre productions. His performance as Happy Loman in Alyque Padamsee's 2013 revival of Death of a Salesman drew the attention of several commentators. Sarbh continued to act in Mumbai-based plays including Rajat Kapoor's What's Done is Done, Rage Productions's The Glass Menagerie, Vickram Kapadia's The Merchant of Venice, Kalki Koechlin's Living Room, and later made his directorial and writing debut with the 2014 production Bull and Eat respectively. He was listed in Forbes India's 30 under 30 list in 2015 for his contributions to the Mumbai theatre industry. Sarbh made his feature film debut with Ram Madhvani's 2016 biographical drama film Neerja. He had two other releases in 2016–Jyoti Patil's Yashodhara and Daria Ghai's 3 ½ Takes. He also worked on the short films Mama’s Boys by Akshat Verma, and Like Summer Like Rain by Gouri Dutt. Sarbh had two Bollywood releases in 2017–the thriller A Death in the Gunj and the romance film Raabta. He also starred in Natasha Mendonca's directorial debut Ajeeb Ashiq, an independent film that focuses on the gender identity and human sexuality. The production was screened at various film festivals across Europe. He played the role of Malik Kafur in Sanjay Leela Bhansali's 2018 epic romance Padmaavat, featuring Shahid Kapoor, Deepika Padukone and Ranveer Singh. ^ a b Pillai, Pooja (3 April 2016). "Neerja Actor Jim Sarbh Acting Naturally". The Indian Express. Retrieved 17 April 2016. 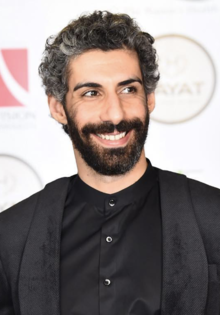 ^ "Meet Jim Sarbh, the terrorist who gunned down Sonam Kapoor in Neerja". India TV. 1 March 2016. Retrieved 18 April 2016. ^ a b c Ghose, Amesh. "Mumbai Theatre's "Outrageously Hot Guy", Jim Sarbh, Is Back With A Death In The Gunj". Man's World. Retrieved 22 April 2018. ^ Chatterjee, Arundhati (10 March 2016). "All you need to know about Jim Sarbh: The hijacker from Neerja". Hindustan Times. Retrieved 22 April 2018. ^ Banerjee, Jasodhara (9 February 2015). "Forbes India Magazine - Role play: The many faces of Jim Sarbh". Forbes India. Retrieved 11 April 2016. ^ Shah, Tutu (28 February 2016). "Rehearse to the extent that you exceed psychology: Actor Jim Sarbh bares it all - Firstpost". Firstpost. Retrieved 18 April 2016. ^ "Playing terrorist in 'Neerja' was challenging: Jim Sarbh". The Indian Express. 24 February 2016. Retrieved 18 April 2016. ^ a b Magan, Srishti (31 January 2018). "Ranveer Was Great, But Why Isn't Anyone Talking About Jim Sarbh's Superb Performance In Padmaavat?". ScoopWhoop. Retrieved 23 April 2018. ^ "Suman Sridhar and Natasha Mendonca to Present a Double Bill at the Tate Modern Museum". Rolling Stone. 16 May 2017. Retrieved 23 April 2018. ^ "Star Screen Awards 2016 winners list: Pink wins big, Big B-Alia get best actor and actress award". India Today. 5 December 2016. Retrieved 28 January 2018. ^ "Zee Cine Awards 2017: Salman Khan to Alia Bhatt, Amitabh Bachchan to Anushka Sharma - Who won what? | Latest News & Updates at Daily News & Analysis". dna. 12 March 2017. Retrieved 28 January 2018. ^ Hooli, Shekhar H. (17 February 2019). "Asiavision Movie Awards 2018 winners list: Ranveer Singh, Dhanush and Trisha honoured [Photos + Videos]". International Business Times, India Edition. Retrieved 18 February 2019. This page was last edited on 25 April 2019, at 14:29 (UTC).